Experience the dolphins as you explore the waters on your very own Jet Ski! Our veteran guides will will take you on a 2 hour adventure on the waters surrounding Shell Island, allowing you plenty of time to encounter dolphins and explore Shell Island itself. St. Andrews Bay is the perfect setting for dolphin encounters. Flippers has been providing Dolphin Tours for a while now and has come to be recognized as one of the best Jet Ski Dolphin Tour experiences available. We take great care to ensure the safety of all dolphins we encounter while still creating an up-close and personal experience for you. 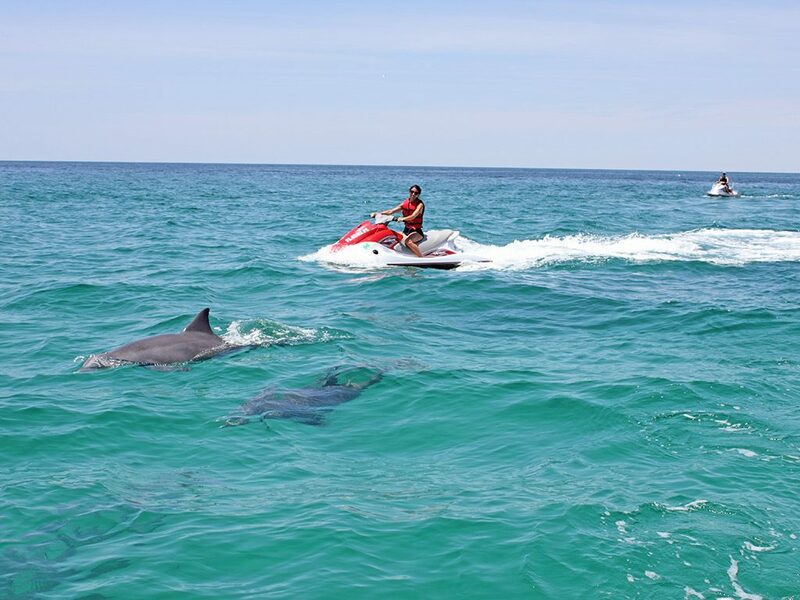 If there is one adventure you choose for your Panama City Beach vacation, you won’t regret making it a Jet Ski Dolphin Tour with Flippers. The Best Panama City Beach Jet Ski Dolphin Tours! “I went on Flipper’s 2 hour guided jet ski tour with my 8 and 10 year old daughters. They both rode on the wave runner with me, and we had the BEST time. Brian was our tour guide, he was knowledgeable, fun, and great with the girls. We got to see dolphins, swim in the water with them, visit shell island, and since neither of my girls could touch the bottom to get sand dollars Brian offered to let them be his “wing men” as he made sure he found a sand dollar for everyone in the group. This was an incredible experience, I recommend it for anyone! Definitely want to do it again! Is a Jet Ski the same thing as a Wave Runner? Pretty much. Some people call them Wave Runners others Jet Skis. It’s basically like the difference between a Honda & a Toyota. We use new, top of the line Yamaha Wave Runner vx110s. They are fast and comfortable for up to 3 passengers or 400lb. Will we see dolphins on the Jet Ski tours? 99% of the time our guides will get you up close and personal with our famous friendly dolphins. Our experienced guides know their favorites spots, & where they can be found. Of course, they are wild creatures so we can’t absolutely guarantee an encounter on the tour but Panama City Beach is home to one of the largest dolphin populations in the world so it’s almost certain you’ll run into at least a few while out on the tour. Will we get to see Shell Island? Our guide can show you the best spots of this pristine uninhabited paradise and you can take as much time as you’d like to explore and search for souvenir seashells to bring home. We can stop to snorkel the coastal shallows, play with the dolphins or whatever else you want to do as well. Our Jet Ski Tours are fast paced and if you want to go wide open you will have that opportunity but for those who want to go a little slower we can accommodate you as well. Whatever your thrill or skill level you will have a blast on this Jet Ski Adventure! What if we've never been on a Wave Runner before? Then you’ve been missing out on some exciting action! You don’t have to be an expert, or even experienced to take our Wave Runner tours. We’ll supply you with all the instruction you need to have to operate these machines safely. It’s easy, simple & did I mention, an absolute blast! Do we drive our own Wave Runner? Yes. 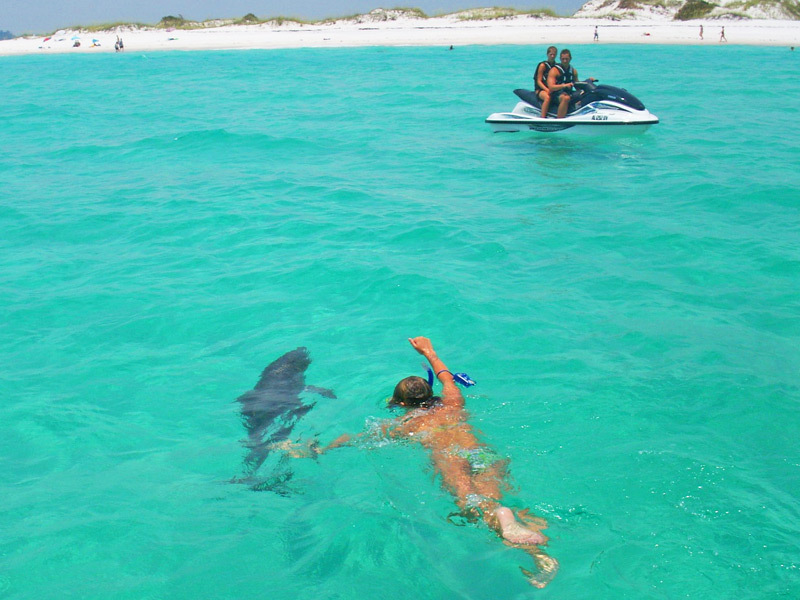 This is a guided tour but the tour guide will ride his own jet ski & you will ride your own. Are the prices per person or per Jet Ski? Prices are per machine. You can ride 2 or possibly 3 on each Jet Ski depending on weight. How old to be a passenger on Jet Ski? That’s primarily up to the parent, but 5 or older is usually the best advice. The tour is fast paced & passengers may be in for a wet bouncy ride. After all this is a Shell Island, Jet Ski Adventure Tour! How old do you have to be to operate a Jet Ski on the guided tour? State of Florida - boat operator regulations. Florida law requires that anyone born on or after January 1, 1988 who drives Jet Ski Rentals in Panama City, to have a picture I.D. in their possession AND a boater safety certificate, issued by the Florida Fish and Wildlife Commission. If you would like to receive a temporary boater’s certificate, you can take the test at our Marina. Please arrive 30 min. prior to your tour time to take the boaters safety course or go online & take it at: http://myfwc.com/boating/safety-education/courses/ please call our office if you have any questions, (850) 588-8700. The Wave Runners do have plenty of storage but anything you take risk the possibility of getting wet. We recommend a waterproof camera & a mask for swimming. We sell both here at the marina. If you cancel at least 48 hours before your arrival date then you will receive a 100% refund. If the weather is severe and we determine that you cannot go out on the day you are scheduled, then you will also receive a full refund. If there is any need to change dates or times, please give our office a call as soon as you foresee a problem so that we can to reschedule you. As long as you have given us sufficient notice there will be no charge for rescheduling.